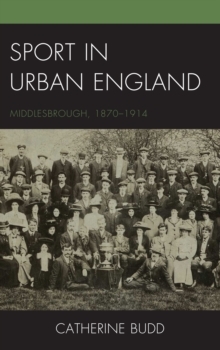 This book examines the largely unexplored social and cultural history of Middlesbrough and the leisure habits and opportunities of its people. It adds to existing studies of urban Britain and provides a specific study on the relationship between leisure and urbanization and industrialization. The book furthers understanding of urban sport and urban history by demonstrating how sport can be shaped by urban growth, whether directly or indirectly, and equally, how sport can also affect the way in which a town develops. This book shows how the study of sport in a particular setting provides another means of examining relationships between different social groups and within a large urban landscape. This book views the town's sporting history alongside the development of Middlesbrough itself and within the context of the growth of sport in Britain more widely. Furthermore, as a study in urban history, this book addresses existing gaps in our knowledge of the development of towns and cities by examining the town's sport. Through a detailed examination of local newspapers and archival sources, this book reveals the depth and diversity of the town's sporting culture. In particular, it illustrates the role of the middle classes in the development of clubs, and the importance of class and social relations in determining an individual's access to sport. As a consequence, the study also relates how the town's working class populace was often excluded from the sporting culture, and shows the lack of sporting opportunities available to women. Amateurism is explored through the initial rejection of professional football, but the book also demonstrates the increased popularity of the professional game during this period. In addition, in view of Middlesbrough's migrant population, the extent of football's role in forming and reinforcing local and regional identities will be examined.